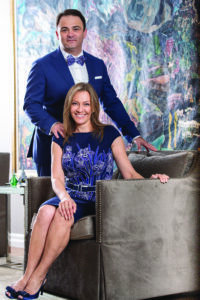 Since arriving in Hamilton as newlyweds, Luba and Yves Apel have become role models for their business and community involvement and achievements. Luba’s superb organizational skills have benefited the Kehila School, Temple Anshe Sholom and many JNF Negev Dinners. 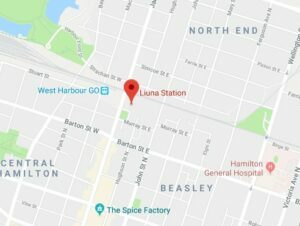 She currently co-chairs the Lion of Judah program at the Hamilton Jewish Federation and serves on the Board of the Flamboro Skating Club. During the past 25 years in the investment field, Yves has built a leading financial advisory practice, and has made a significant contribution to Jewish life in Hamilton. For many years he served as President of the Kehila School Board, was a Treasurer of Temple Anshe Sholom, co-chaired JCC Walkathons, and chaired the Hamilton Jewish Federation Annual Campaign, as well as its Allocation Committee. Yves is currently a Shalom Village Board member and an active contributor to numerous other professional and community committees. 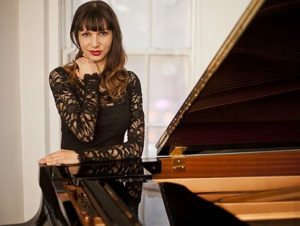 Yves and Luba were the inaugural honourees of Kehila’s “Art of Giving” fundraising gala, and recent recipients of the Federation’s Shem Tov and President’s Awards. 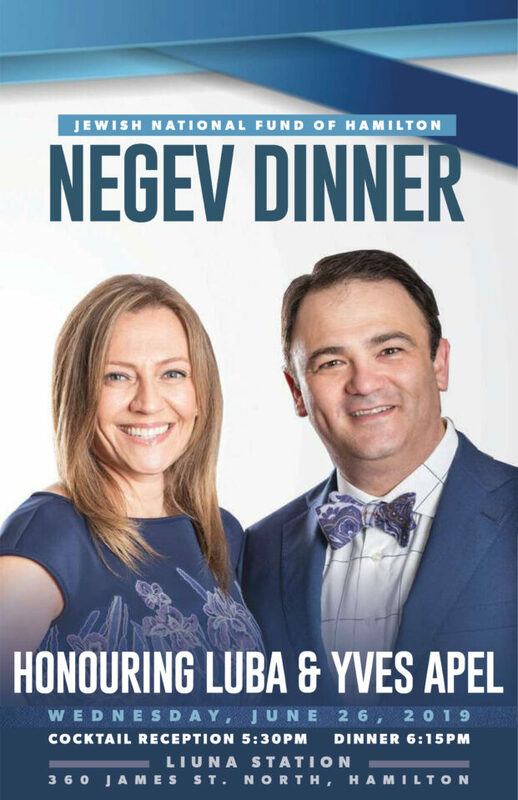 The With two children at Western University and one in high school in Israel, the Apels are the Negev Dinner’s youngest honourees, and represent a new kind of leadership in our community. According to the World Health Organization,one in four people inthe world will be affected by mental illness at some point in their lives. JNF is collaborating with Herzog Medical Centre and the Israel Centre for the Treatment of Psychotrauma,which is internationally recognized for its substantial expertise in treating post-traumatic stress disorder (PTSD). PTSD can be brought on by a wide spectrum of traumatic experiences including natural disasters, domestic violence, sexual assault, and school bullying, as well as war and terrorism. Proceeds from the 2019 Negev Campaign will help build a facility for Herzog Medical Centre in Jerusalem. It will house medical services specializing in psychological trauma and other mental health issues for people of all ages, education, income levels,and ethnic and religious backgrounds.Currently, services are provided in an outdated facility which cannot support the number of people who require attention. With your support, JNF Canada will build the Glassman PTSD and Medical Centre, which will include a state-of-the-art treatment room to provide patients with an improved opportunity to access a range of crucial services, treatments, and supportive services. JNF is proud to fund this treatment room in honour of Luba and Yves Apel. Tickets(s) at a special price of $99* for anyone 25 years of age and under.